I found myself at home unexpectedly yesterday afternoon, and what better way to enjoy an afternoon free from work than with a cup of tea? It is finally what I consider Christmas season (I don’t start until after Thanksgiving) and I have a few great holiday teas to share in the upcoming weeks. 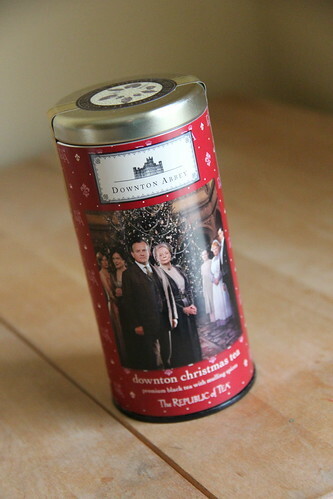 This afternoon I decided to start with a cup of Republic of Tea‘s Downton Christmas Blend, in my very own Downton Abbey mug. From the packaging the blend contains black tea and mulling spices, including cinnamon, cloves, licorice root and apple pieces. It’s available in a canister of 36 tea bags for $12.00. Be sure you order soon because it’s marked as a limited edition! When I first opened the package I smelled cloves and maybe a bit of orange. The orange isn’t listed in the ingredients, but I wonder if there’s a bit of peel in the mulling spices? Once brewed I smelled the cinnamon. This was a great black tea with the extra flavor of the mulling spices. It would be perfect for a cold night in the snow, or an afternoon spent decorating for the holidays. This one is definitely going to be a favorite – so how many tins should I stockpile? Many, many tins! 😀 Thanks for the review. 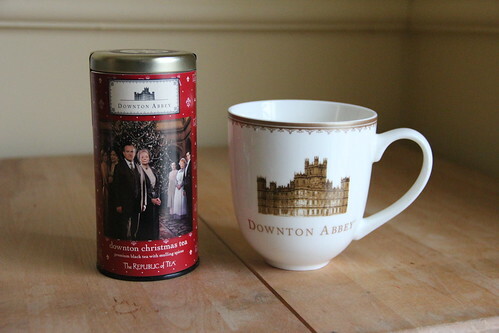 I’ve been debating trying this, but I already have like three other Christmas teas. But if it’s limited edition…I really have no choice. I totally agree. No choice whatsoever.